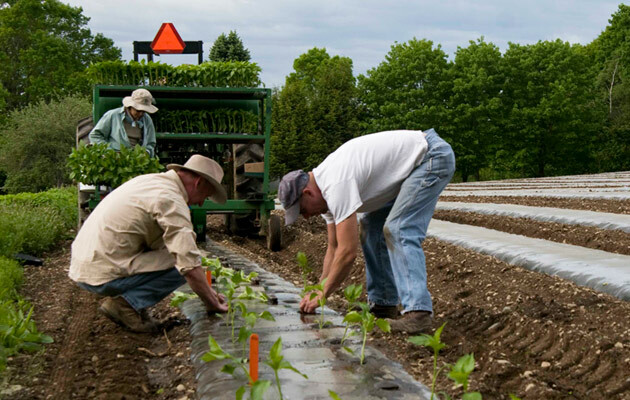 Transplanting peppers into the field at Johnny's Research Farm, Albion, Maine. Optimize yield by starting your own pepper transplants. For many growers, peppers are one of the most strikingly diverse and profitable vegetable crops. Peppers encompass dozens of types, in many colors, shapes, and flavors that run the gamut from sweet bells to pungent habanero. Along with diversity, peppers have versatility: harvest them green or let them ripen to their mature color — providing you with a longer harvest window as well as the opportunity for stunning multicolor market displays. You can market them fresh, dried (bagged or in ristras), pickled, and, with the proper equipment, roasted. You can price them by the piece or sell the lunchbox types in containers or bagged. You may even tap into entirely new markets by growing specialty peppers used in ethnic cuisines. To take full advantage of all the pepper possibilities, you have to grow your own transplants. Pepper seedlings are not hard to start, but they are somewhat picky. And because yield can be affected by the quality of the transplants, you will want to pay special attention to your young pepper plants' needs. Here are some tips for getting your pepper seedlings off to a healthy start. Timing is everything with peppers. They are a warm-season crop, like tomatoes and eggplants, and will not thrive when temperatures are below 60°F/16°C. On the other hand, very little fruit set occurs above 90°F/32°C, especially with bell peppers. Some hot peppers are more heat-tolerant. The best scenario is to get peppers transplanted as soon as the weather is warm and settled, so that fruit set occurs when temperatures are between 65°F/18°C and 85°F/29.4°C. Of course, weather is beyond a grower's control, and the ideal conditions may not occur in some locations and some years when high temperatures arrive earlier than usual. In such cases, early yield may be reduced but plants will grow vegetatively until conditions are right to resume fruit set. Seed into 20-row flats and provide bottom heat for optimal germination. Sow seeds 8 weeks prior to transplanting. Pepper seeds should be planted ¼" deep in a fine-textured seed-starting mix or vermiculite to provide good drainage. We recommend using a 20-row seed flat; the shallow channels in the flat allow you to minimize the amount of growing medium needed while maximizing the number of seeds you can start on a heat mat. The channels also provide a convenient way to grow multiple varieties and keep them separate. 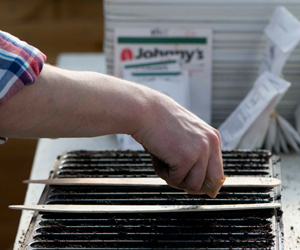 Bottom heat of 80–90°F/27–32°C is essential for pepper germination. Seeds will germinate in 7–8 days at that temperature; at lower temps, germination is slower, erratic, and percentage germination is reduced. Once germinated, pepper seedlings need light — ample, full-spectrum wavelength light. At many latitudes at the seedling-starting time of the year, window light is insufficient, and some grow lights are inadequate to the task as well. See our Guide to Choosing a Grow Light for information on light quality and choosing a unit suited to your needs. In about 2 weeks, when the first true leaves begin to form, carefully separate the seedlings and transplant them into cell trays or pots. Choosing the correct cell size is another balancing act. On the one hand, you want the pepper plant's roots to fill the cell so that the root ball holds together when you plant it outside. On the other, you don't want the plants to become rootbound, especially if poor weather delays planting. An oversized, rootbound transplant will be significantly stressed and result in a compromised crop. 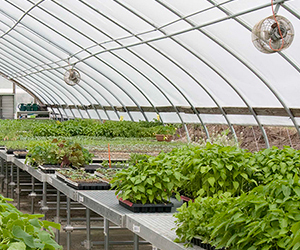 You also have to make the most of your greenhouse space, so you don't want to grow your transplants to an unnecessarily large size. A 50-cell or 72-cell tray is a good choice for pepper seedlings that will be grown for 8–10 weeks before being transplanted. 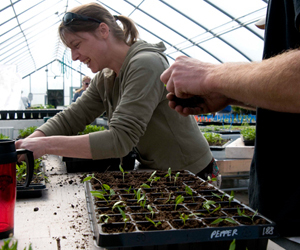 Once the seedlings have been transplanted to the cell trays, grow them at 70°F/21°C days, 60°F/16°C nights. Use a well-drained growing medium in the cells, and take care not to overwater seedlings; wait until the soil is dry before watering again. Water once or twice a week with a fertilizer solution diluted to 100 ppm. Plants also can be watered with RootShield®, an OMRI-listed product containing a beneficial fungus that helps protect roots against damaging, soilborne fungal diseases such as Pythium and Fusarium. Harden off the seedlings before transplanting. When the seedlings are about 7–8 weeks old, they should be 6–8" tall. Ideally, they will have some buds but no open flowers. Harden off the plants by decreasing the day temperature to 60–65°F/16–18°C for 1 week before transplanting. 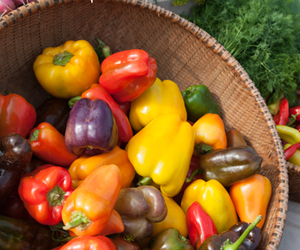 Peppers perform best in well-drained, fertile soils with a pH of 6.5. Abundant levels of phosphorus and calcium will result in better yields. 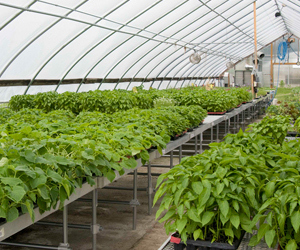 When the weather has settled and the threat of frost has passed, the peppers can be planted into the field or hoophouse or greenhouse. Bury them a bit deeper than the root ball to encourage additional root growth that will make them sturdier. 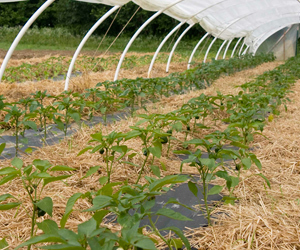 Plastic mulch and row cover can be used to increase warmth and hence, earliness and yield. You can use hoops to prevent the row cover from rubbing across the plants' tender growing tips. 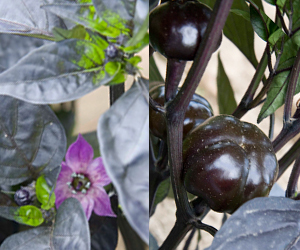 Peppers have perfect flowers, meaning each flower has both male and female parts and the plants can self-pollinate. Bees and other pollinators are not absolutely necessary fertilization and fruit production. With well-grown transplants and help from benign summer weather, you may find that peppers are a profitable crop for your farm.